It was later (1960â€“61) found to be teratogenic in fetal development, most visibly as a cause of amelia or phocomelia, especially if taken during the first 25 to 50 days of pregnancy. Around 15,000 fetuses were damaged by thalidomide, of whom about 12,000 in 46 countries were born with birth defects, with only 8,000 of them surviving past the first year of life. Most of these survivors are still alive, nearly all with disabilities caused by the drug. In 2003, a World Health Organization newsletter cited evidence that the disabilities and deformities in many thalidomide survivors may be passed on to the survivor's own children through DNA, but many discount this as scientifically unfounded. Those deformed by thalidomide are sometimes referred to (or self-described) as thalidomiders or the derogatory abbreviative, "Flids". Thalidomide was banned for its initial intended use as sedative. However, it has been found to be effective for other indications such as for leprosy and multiple myeloma. It is now marketed by Celgene as Thalomid with standard warnings for pregnant women to avoid taking it. Thalidomide had passed safety tests performed on animals, primarily because the proper tests â€” particularly those involving pregnant animals â€” had not been done. A court trial revealed that some tests were either conducted inadequately, or the results were faked. There is also some evidence that the tests were carried out on a particular isomer of the drug, which forms a racemic mixture in the body. One element of this mixture has the intended beneficial action, while the other creates the horrific side effects. The failure of these tests to discover the drug's disastrous consequences highlighted the inadequacy of testing methodologies in use at that time. This resulted in a dramatic increase in animal testing across a broad range of species in varying stages of pregnancy and lifecycle. 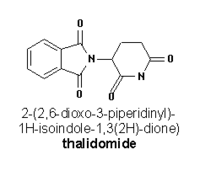 In fact, later tests did demonstrate that administering thalidomide to rabbits and mice produces characteristic deformities in the offspring, although thalidomide has no effect on pregnant rats' offspring, (see Blake DA, Gordon GB, Spielberg SP. The role of metabolic activation in thalidomide teratogenesis. Teratology 1982;25(2):28A-29A.). If adequate testing had been done, thalidomide would never have been approved for pregnant women. Some opponents of animal testing still incorrectly cite thalidomide as an example of the ineffectiveness of such testing. In 1960, Chemie GrÃ¼nenthal decided to expand into the United States, and applied to the Food and Drug Administration for approval to sell the drug. This approval was not expected to be controversial, and the case was given to the agency's newest reviewer, Frances Oldham Kelsey. Kelsey had previously done animal toxicity research (including effects in pregnancy), and refused to clear thalidomide for sale until she obtained better documentation of its effects, especially in light of some unusual neurological side effects being reported in Britain. In fact, the testing had not been performed adequately, and satisfactory documentation was not forthcoming.